Every day, our kitchen and bathroom sinks drain more than just water, they must handle hair, soap, grease, and food waste. Being careful about what we put down our drains can help prevent clogs. But, no matter how careful we are, our drains may begin to build up and slow down. You can help prevent deteriorating drain performance with DrainRight® Drain Maintainer. DrainRight® Drain Maintainer is exclusively offered by the ARS®/Rescue Rooter® Network. DrainRight® Drain Maintainer helps to maintain your pipes by preventing clogs before they form, to keep your plumbing flowing. DrainRight® Drain Maintainer is made from a special formula that liquefies and disperses grease, soap scum, food residue, and other waste build-up. DrainRight® Drain Maintainer also cleans and deodorizes drain lines, vent lines, and grease traps. 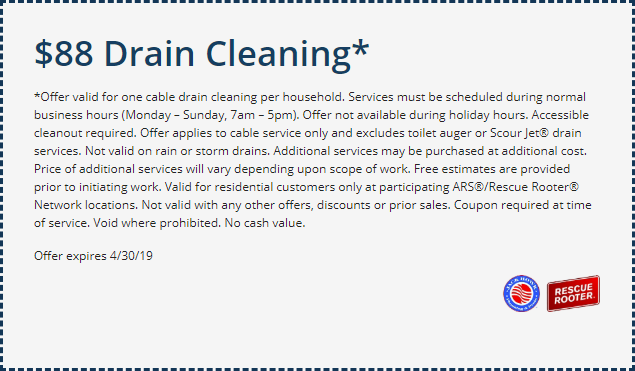 *Offer valid for one cable drain cleaning per household. Services must be scheduled during normal business hours (Monday – Sunday, 7am – 5pm). Offer not available during holiday hours. Accessible cleanout required. Offer applies to cable service only and excludes toilet auger or Scour Jet® drain services. Not valid on rain or storm drains. Additional services may be purchased at additional cost. Price of additional services will vary depending upon scope of work. Free estimates are provided prior to initiating work. Valid for residential customers only at participating ARS®/Rescue Rooter® Network locations. Not valid with any other offers, discounts or prior sales. Coupon required at time of service. Void where prohibited. No cash value. DrainRight® Drain Maintainer is 100% biodegradable, so it won’t harm your pipes or the environment. It’s non-acidic, non-caustic, non-corrosive and safe to use on any kind of pipe or drain. Contact Jack Howk SM/Rescue Rooter® today to find out more about our professional-strength concentrated DrainRight® Drain Maintainer or to place an order.